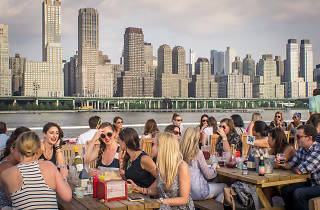 Photograph: Paul WagtouiczNorth River Lobster Co.
At Pier 81, this former Florida gambling ship rejiggered with New England charm, offers three decks for imbibing and watching the sun drop during its fast-casual cruises up the Hudson. 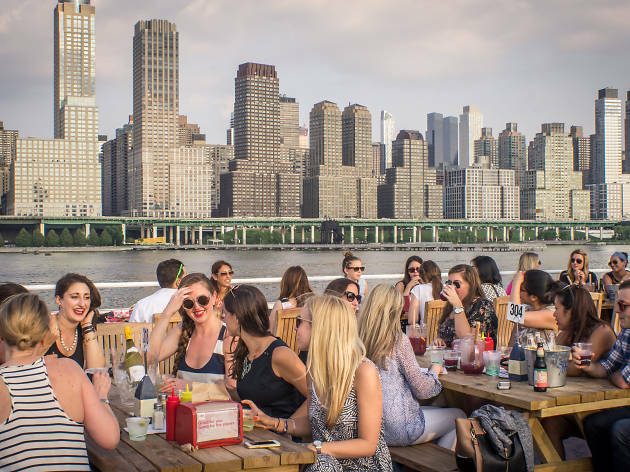 Sit at blond-wood picnic tables on one of three decks to admire the West Side skyline, and watch the river stretch under the George Washington Bridge and disappear beyond upper Manhattan. 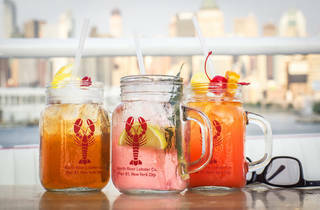 Find fresh Maine lobster scooped into sublimely buttered buns and nautical-inspired cocktails, plus standard beachy beers (Corona, Pacifico, Blue Moon) on the sea-faring docket. Even though the company has started charging a passenger fee for the boat, it's still a must-do during summer. 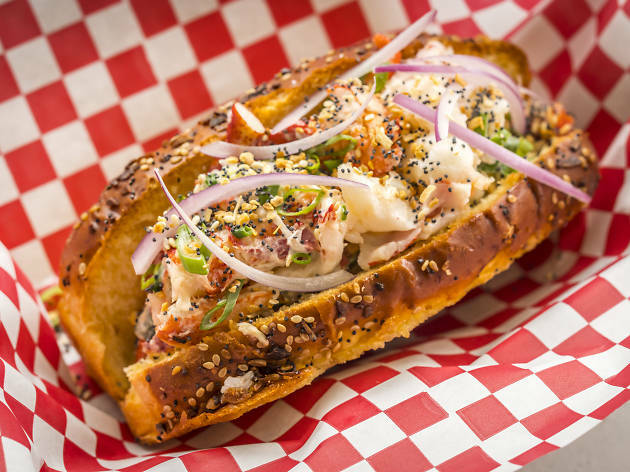 The $10 is more than worth it, and once you're sitting with a glass of sangria and a fresh lobster roll you'll be too focused on the fun you're having than what you're paying. If you work in midtown and are looking for a new post-office happy hour spot, head here with your work squad ASAP. I absolutely LOVE this boat. I went with two girl friends over the summer, and we stayed on for hours. Get there early, and get yourself a seat. It is free to ride, just pay for food and drinks. We took turns ordering a bucket of beer, and I had a lobster roll which was delicious! You can continue to ride the boat as many time as you want, or get off after one round when it redocks. Can't wait until it is nice enough to do this again! I love the lobster boat!!! It's definitely a scene but seems more relaxed than Frying Pan. Come early if you want to get seats and bring sunscreen. It's free to get on and you can stay on as long as you like. Their schedule is on the website and they're very punctual but in case you miss the boat, they have a bar on the dock so you're able to enjoy drinks while you wait for the boat to come back. So far this is my favorite bar on a boat in the city! I loved my experience at the North River Lobster Company. It's free to enter and you really choose for how you're paying by purchasing food and drink. I don't really recommend the drinks all that much since they tend to be watered down but they were delicious and great to share with. This boat is definitely more geared for larger groups since smaller tables and couples tend to get swallowed by the sheer number of people. If you do get a group going, make sure to lie and say that your meeting time is actually 30-45 minutes before the boat actually takes off because your friends will get left behind if they get there too late. Loved the truffle fries and lobster roll! I love the lobster boat. 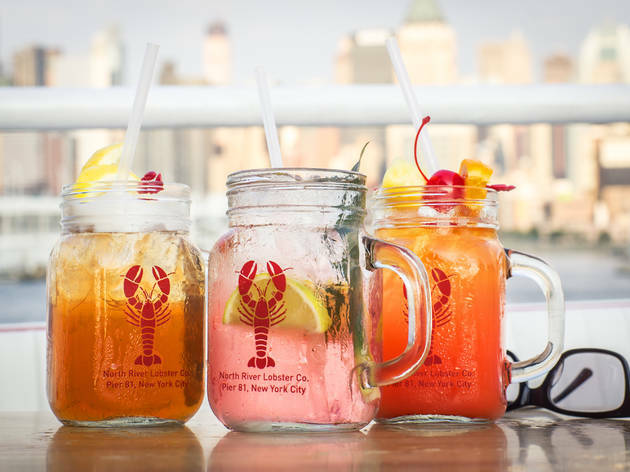 Great seafood that might be a bit overpriced, but when a free 45-minute cruise of the Hudson is taken into consideration, the deal is not bad. Great lobster rolls, awesome raw bar and good drinks, this is a great place to spend a leisurely summer afternoon. Maybe I have been there at off-times, but it is always easy to nab a seat and the order-at-the counter food/drink system makes for quick and easy service. Check on line for sail times, because if you arrive ahead of time and the boat is out (gone for 45-minutes ever hour and a half or so) you'll have to wait at the dock (which is not bad, they have a bar). You can also hang out on the boat while it is stationary, once it returns from sail. 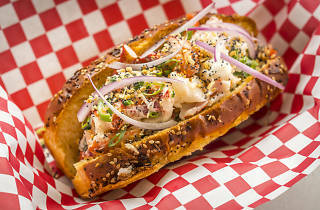 A delicious, reasonably price lobster roll aboard a gratis boat ride with delicious libations to boot? It's a city steal. Get there earlier than you intend to eat to compensate for the wait to get on the boat.